^ Michael Grynbaum (September 15, 2008). "Wall St.'s Turmoil Sends Stocks Reeling". The New York Times. Archived from the original on April 11, 2011. Retrieved September 15, 2008. ^ CQ Transcripts Wire (November 4, 2008). "Sen. Barack Obama's Acceptance Speech in Chicago, Ill". The Washington Post. Retrieved November 5, 2008. ^ "Obama Acceptance Speech". Times of the Internet. November 4, 2008. Archived from the original on November 8, 2008. Retrieved November 5, 2008. ^ "Chicago News - 11/05/08". ABC. Retrieved November 5, 2008. ^ Gilbert, Debbie (November 6, 2008). "Residents relate the personal significance of this election". Gainseville Times. Archived from the original on January 10, 2013. Retrieved November 8, 2008. ^ Kenneth Vogel, "Obama move irks reform allies," The Politico, June 19, 2008. 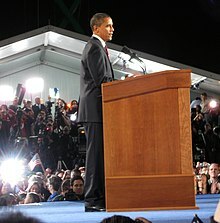 Retrieved June 21, 2008; Liz Sidoti, "With money, Obama to try to widen the battleground[permanent dead link]," Associated Press, June 20, 2008. Retrieved June 21, 2008. See also: Alan Silverleib, "Analysis: Rejecting public funding won't hurt Obama," CNN News, June 20, 2008. Retrieved July 7, 2008. ^ a b Talbot, David (February 24, 2009). "Personalized Campaigning". MIT Technology Review. Retrieved December 3, 2016. ^ Talbot, David (August 19, 2008). "How Obama Really Did It". MIT Technology Review. Retrieved December 3, 2016. ^ Talbot, David (January 8, 2009). "The Geeks Behind Obama's Web Strategy". Boston.com. Retrieved December 3, 2016. ^ a b Smith, Ben (June 21, 2011). "Dem campaigns embrace new software". Politico. Retrieved December 7, 2016. ^ a b Scola, Nancy (May 13, 2011). "NationalField: The Private Social Network That's Reinventing the Ground Game". TechPresident. Retrieved December 7, 2016. ^ Dickinson, Tim (March 29, 2012). "Inside Obama's Campaign". Rolling Stone. Retrieved December 7, 2016. ^ Sifry, Micah (October 9, 2011). "How Obama's data-crunching prowess may get him re-elected". CNN. Retrieved December 7, 2016. ^ Sizemore, Justin (August 14, 2008). "The Democratic Ground Game". Larry J. Sabato's Crystal Ball. Retrieved December 3, 2016. ^ Creamer, Matthew (October 17, 2008). "Obama Wins! ... Ad Age's Marketer of the Year". Advertising Age. Retrieved June 17, 2014. ^ Creamer, Matthew (November 10, 2008). "Barack Obama and Audacity of Marketing". Advertising Age. Retrieved June 17, 2014.